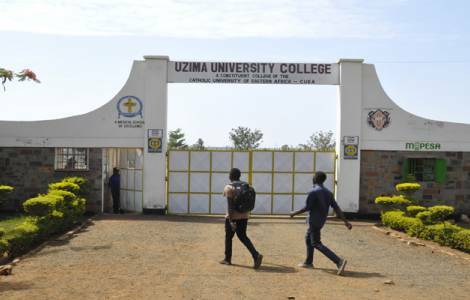 Nairobi (Agenzia Fides) - “The Catholic University College in Uzima was born of an idea of Emeritus Bishop Zacchaeus Okoth. Moved at the sight of needy suffering people, especially in the region of western Kenya, he decided to collect funds to build a medical centre ” says Fr Cosmas Rhagot K’Otienoh, Rector of Uzima University College, an institution founded in the archdiocese of Kisumu and connected with the Catholic University of West Africa, and has offered courses in medical training since 2012. The first group of medical doctors graduated in October this year. “Our centre is the first of its kind in Africa” says Fr. Rhagot. “On 27 August 2012 it opened to accept the first 21 students. It was a humble beginning offering in degrees in medicine, surgery and nursing ” the Rector recalls. “At the end of the first year we realised the need for other courses and so we added Bachelor of Science in Microbiology and Bachelor of Science in Clinical Medicine, divided in two courses: Diploma in Clinical Medicine, a three year course and Bachelor in clinical medicine, four year course. These new courses have increased the number of students anxious to specialise in other fields of medicine. We have also a Degree Course in Community Health and Nutrition”. “At present Uzima College has 603 students following the courses mentioned above. Our goal is to reach a total number of a thousand students and so we have invited AMECEA countries to send us students are interested in a career in medicine here in Uzima College” the rector concluded. VATICAN - Cardinal Filoni to novices and seminarians of Lubango: "become men and women of God"